Simultaneously, at Nationals Park, Washington starter Livan Hernandez will do the same with Braves’ LF Martin Prado. And the MLB season will be underway. That means hope. That means excitement. And, to me, that simply means summer is here! I know, spring is only technically ten days old. Don’t care. Baseball is summer. It’s as simple as that. As I look out my window, the snow is almost completely gone – which is nice after last week’s final, ten-centimetre blast of winter. 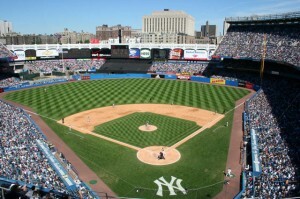 Now, I’m looking at Yankee Stadium. It’s beautiful. It doesn’t matter if you love the Yankees or hate the Yankees. The stadium is beautiful. Any stadium is beautiful. And, at the beginning of every season, I’m reminded of how long baseball has been a part of my life. When I was nine years old, my aunt and I flew to Montreal to see my first major league games at Jarry Park. We sat right behind the Expos’ dugout. I remember Rusty Staub and Bill Stoneman. 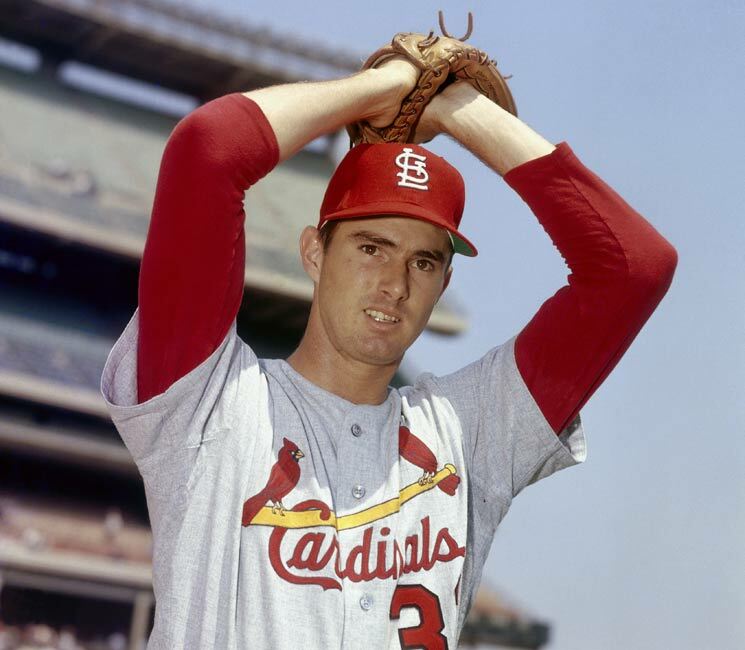 I remember Cardinals’ stars Lou Brock and Steve Carlton. We went to see Bob Gibson pitch. He didn’t, but it didn’t matter. The Yankees have just run onto the opening-day field. I remember going to the 1979 MLB All-Star Game at the Kingdome in Seattle. Dave Parker threw out Jim Rice and Brian Downing on the bases. And I loved seeing Angels’ pitcher Nolan Ryan. Loved the guy. CC Sabathia is warming up. And, living in Toronto, of course I remember the autumn of 1992. The Blue Jays had been an American League powerhouse for almost a decade, but had never reached the World Series. Not only did they get there in ’92, they won. Jackson takes Sabathia’s first pitch for a strike. Game Six, in Atlanta, was insane. The Jays had it won, then gave up the tying run to the Braves in the ninth. The Jays took the lead in extras and, when pitcher Mike Timlin flipped the ball to first baseman Joe Carter, our tiny apartment went wild! Jackson goes down swinging. One out, 2b Will Rhymes now facing Sabathia. The parade down Yonge Street, after that Jays’ triumph in 1992 was pure fun. The people of Toronto were just so joyous. Yankees’ centerfielder Curtis Granderson makes a very nice diving catch to retire Rhymes. Toronto deserves another winner. It’s been almost twenty years since they’ve reached the postseason. In steps RF Magglio Ordonez for the Tigers to face Sabathia. 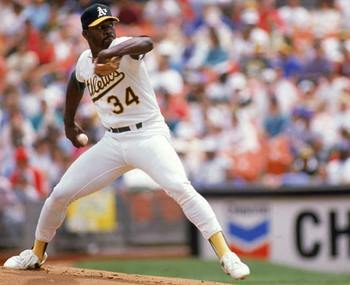 In 1990, Oakland A's Dave Stewart was on top of his game. He finished 22-11, and threw a no-hitter in Toronto. Ordonez lines to Granderson in center, and the Yankees are comin’ to bat. I was lucky enough to be at SkyDome on June 29, 1990. That night, Dave Stewart threw a no-hitter for the A’s against the Jays. 115 pitches, 81 for strikes. We were there with a friend who’d forgotten to wear her glasses. She kept asking, “What’s happening? What’s going on?” Funny, and sad, all at the same time. Then, later that night, Dodgers’ pitcher Fernando Valenzuela duplicated Stewart’s feat. Only time in baseball history that two no-nos have been tossed on the same day. Tigers’ Justin Verlander now facing the top of the Yankees’ order – LF Brett Gardner. The Tigers are wearing a home plate-shaped patch with “Sparky 11” on their right shoulders. That’s in memory of their former manager Sparky Anderson, who passed away last November 4th. Gardner makes a weak flail at strike three. The season has begun, and that means summer has begun. Time to go enjoy it. Tough to argue with Jays’ 2-0 start. But their starting pitching, after Drabek and Romero, is suspect for me. But I’m not sure it matters what happens in the American League. The Phillies have the best starting rotation (Lee, Blanton, Oswalt, Halladay and Hamels). Barring injury, they walk to the World Series…and win it.